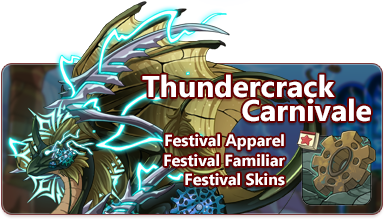 This month, all of dragonkind come together to participate in the Thundercrack Carnivale. This festival celebrates the lightning flight. Our most prized possessions, Charged Sprockets, can be found by using any gathering profession in the lightning territories this week. Neutral and lightning-aligned monsters also have a chance to rarely yield these items as drops in the Coliseum. They may also be crafted at Baldwin's Bubbling Brew using alchemy reagents. The Festive Favors holiday stall is now open for the duration of the holiday and you may trade in Charged Sprockets for exclusive items. It will remain open until the holiday comes to a close on Sunday, July 29th, at 06:00 server time. Your workshop will never be safe again. @AppleDad, @BillyRuffian, @Electropunk, @llithiumstars, @Lumenwood, @PsFox, @Rangsky, @Saerino, @Shika, @skullzhead, @Spinaria, @TalaTari, @Tix, and @Voydbat ! For the remaining duration of holiday, 12 of these skins will be stocking in the Treasure Marketplace and six of them will very rarely gathered by digging in the lightning territory or by battling in the Coliseum. 2 of these skins will be exclusive to Baldwin's Bubbling Brew. Thundercrack Carnivale 2018. (6/14) Designed by BillyRuffian. Thundercrack Carnivale 2018. (5/14) Designed by Electropunk. Thundercrack Carnivale 2018. (7/14) Designed by Tix. Thundercrack Carnivale 2018. (2/14) Designed by AppleDad. Thundercrack Carnivale 2018. (3/14) Designed by PsFox. Thundercrack Carnivale 2018. (11/14) Designed by llithiumstars. Thundercrack Carnivale 2018. (8/14) Designed by Shika. Thundercrack Carnivale 2018. (12/14) Designed by Saerino. Thundercrack Carnivale 2018. (13/14) Designed by Rangsky. Thundercrack Carnivale 2018. (4/14) Designed by Spinaria. Thundercrack Carnivale 2018. (10/14) Designed by TalaTari. Thundercrack Carnivale 2018. (1/14) Designed by skullzhead. Thundercrack Carnivale 2018. (14/14) Designed by Ionil. @bioluminosity, @brightbird, @CasanDragon, @ClickaClack, @Ectopi, @Erithuet, @Excripiileo, @Kaljaia, @MulberryScroll, @nilah, @Phirou, @razrroth, @Sakurawr, @shroudrat, @SwishClang, and @TheSlime ! This looks awesome! I'm still getting used to the new time. 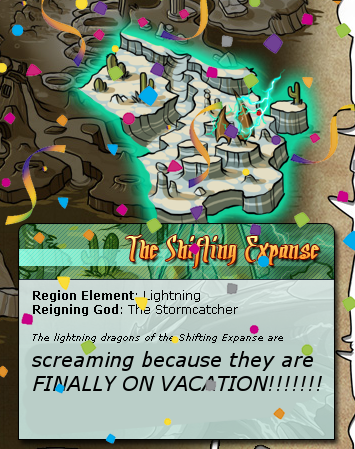 Thanks for the gatherings warning! Just look how happy Vinea is! It's kinda nice to be able to wake up and see a fest start! I absolutely adore what seems to be a trend of beastclan reps, I'm obsessed with them!